Comedian Bill Burr announces 2019 U.K. tour dates, Bill Burr: 50. Tickets go on general sale on Friday 23 November 2018 at 10am GMT at LiveNation.co.uk. For full tour dates and links to tickets visit www.BillBurr.com. Bill Burr is one of the top comedic voices of his generation achieving success in TV and film as well as the live stage. Bill sells out venues internationally and his Monday Morning Podcast is one of the most downloaded comedy podcasts on iTunes. The third season of his hit animated Netflix series, F Is For Family, will premiere on November 30, 2018 featuring Bill, Laura Dern and Justin Long as the Murphy family. On January 31, 2017, Bill premiered his fifth hour-long comedy special, Walk Your Way Out, on Netflix. Bill can currently be seen in the Hugh Jackman film, The Front Runner. He was seen in the Mark Wahlberg and Will Ferrell film, Daddy's Home; he co-stars opposite Kevin Costner in the indie film, Black or White; was seen in the Paul Feig film, The Heat, alongside Sandra Bullock and Melissa McCarthy and in the Al Pacino and Christopher Walken film Stand Up Guys. Bill received raves for his recurring role as "Kuby" on the hit AMC-TV show, Breaking Bad. 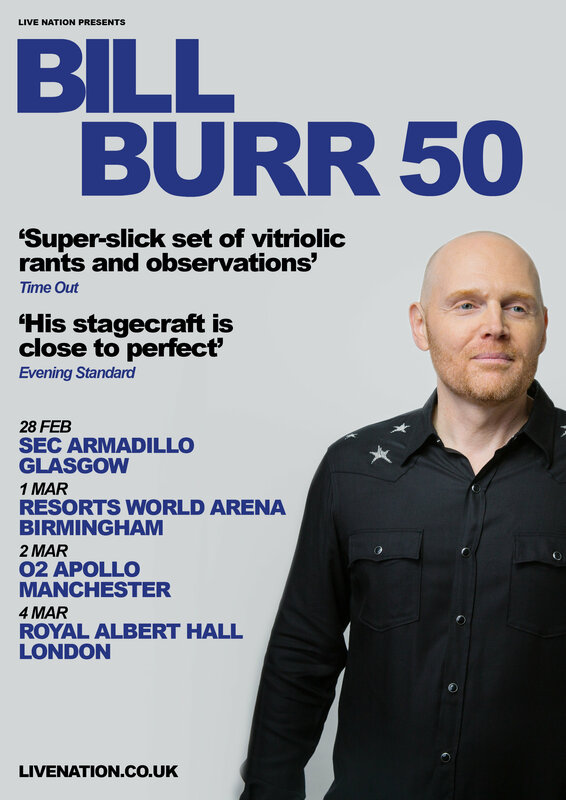 Don't miss Bill Burr on his 2019 U.K. Tour in February and March next year. Tickets go on sale on Friday 23 November 2018 at 10am GMT at LiveNation.co.uk.